In a previous series of posts discussing a recent paper presented by a group of Australian pulmonologists, we debated the use of VATS for decortication of advanced empyemas versus medical treatments. Today, I would like to talk more about the VATS decortication procedure itself. 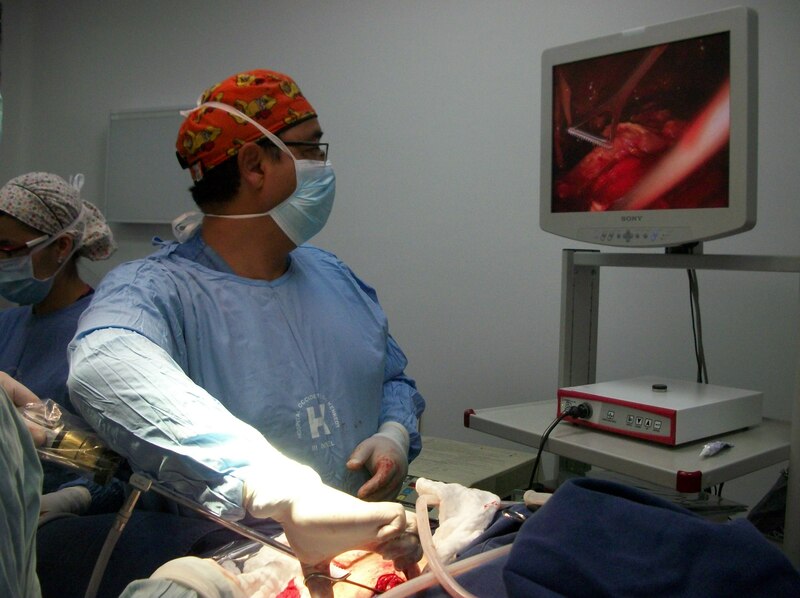 This procedure is performed to remove infected material (pus) from the thoracic cavity so the lung can re-expand. 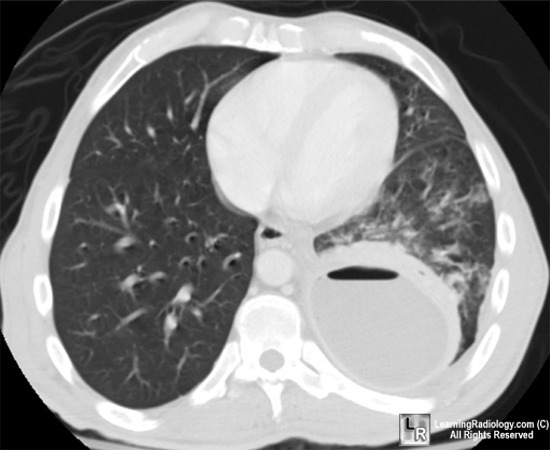 when fully encapsulated as seen in this ct scan may be difficult to distinguish from lung abscess – but note the compressed lung, which is a characteristic of empyema. In these cases, decortication (or peel removal) is necessary for full recovery. If the peel isn’t removed, the lung will remain compressed and infection can easily recur. 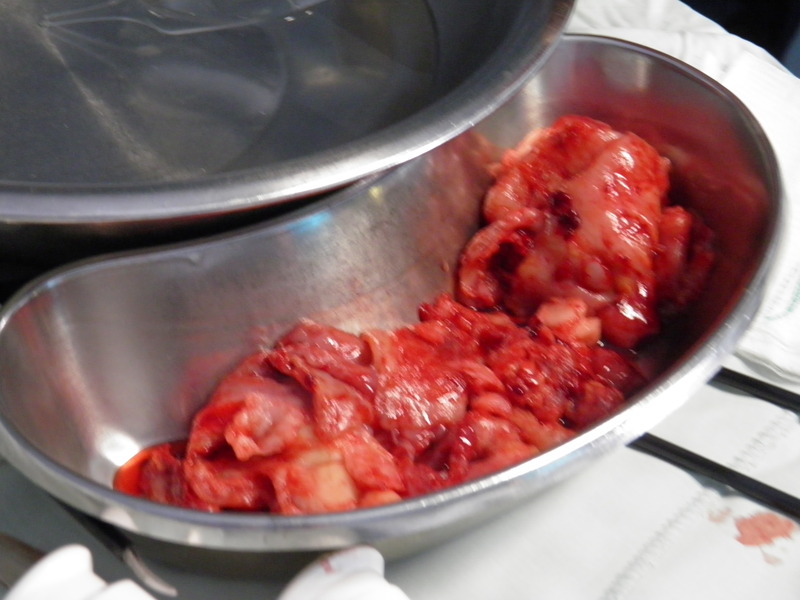 In VATS surgery, several ports are used (small 2cm incisions) versus a larger thoracotomy incision. This isn’t always possible; if the infection is severe, or surgeons are unable to free the lung through the smaller incisions. Sometimes surgeons have to convert to open surgery intra-operatively. However, VATS is preferable for patients, (if possible). Smaller incisions mean less injury, less pain leading to fasting healing, and a shorter hospital stay. Click here to see a video showing a standard thoracotomy incision (with retractors holding it open). For a related case study on VATS decortication. As we mentioned in a previous post – empyema is a serious, potentially fatal infection* – in fact – one out of three patients with this condition will die from it. What’s the difference between empyema and a parapneumonic effusion? Answer: Pus. *while this case report features a patient from Uganda, similar cases have been encountered in my practice here in the USA. Prilozi. 2010 Dec;31(2):61-70. Indications for VATS or open decortication in the surgical treatment of fibrino-purulent stage of parapneumonic pleural empyema. Colanceski R, Spirovski Z, Kondov G, Jovev S, Antevski B, Cvetanovski M V. Article linked in text above, recommending early surgical treatment for better patient outcomes. However, this study did not compare surgical treatments to medical therapies. Asian Cardiovasc Thorac Ann 2010;18:337–43. Thoracic empyema in high-risk patients: conservative management or surgery? Bar I, Stav D, Fink G, Peer A, Lazarovitch T, Papiashvilli M. Limited study of 119 patients showing benefit in both groups of patients with surgery used as primary management strategy in clinically unstable patients. (Increased mortality in this limited study of surgical interventions versus medical management can be attributed to the fact that surgery was used as a last resort in the sicker, more debilitated patients by the authors descriptions). Metin M, Yeginsu A, Sayar A, Alzafer S, Solak O, Ozgul A, Erkorkmaz U, Gürses A. Treatment of multiloculated empyema thoracis. Singapore Med J. 2010, Mar 51(3): 242-6. Comparison of VATS, open surgery and conventional treatment for empyema. Authors recommend VATS for first line treatment. J Thorac Cardiovasc Surg 1999;117:234-8. 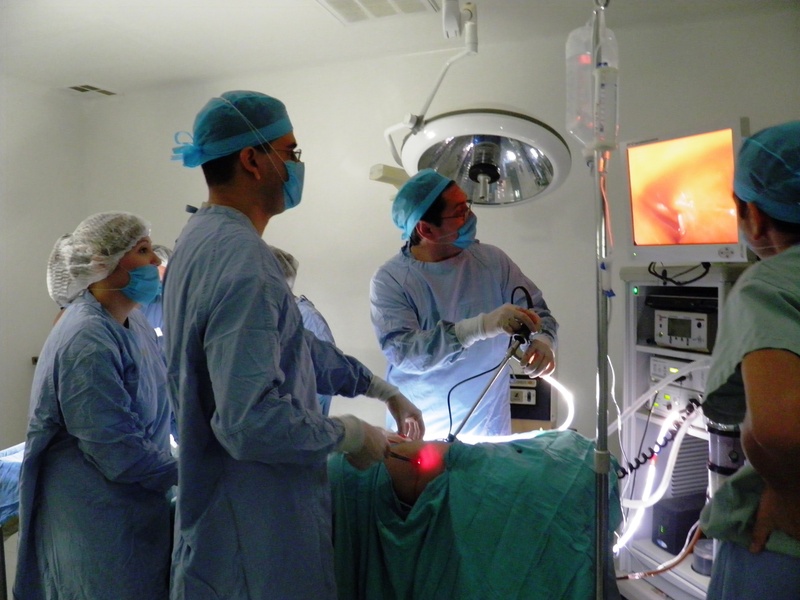 Video-assisted thoracoscopy in the treatment of pleural empyema: stage-based management and outcome. Cassina PC et al. Authors discuss the results of VATS decortication in 45 patients after failed medical treatment and attempted thoracostomy drainage. 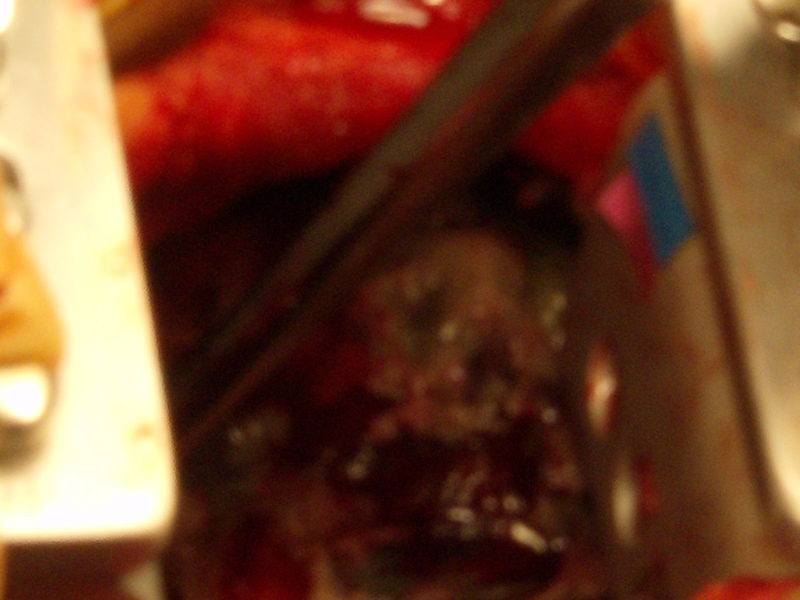 Several patients required open thoracotomy due to late organized infectious process. Really great article, my uncle, a 9/11 veteran, is looking at decortication as a means of getting rid of his mesothelioma. So I’m out looking for information for him. Decortication for mesothelioma is a different operation but some of the principles are the same – the pleura (or lining) of the chest wall/ lung is removed – in your uncle’s case, to rid the body of tumor tissue. The latest research shows some promising results when comparing pleurectomy decortication to extrapleural pneumonectomy. If these results can be replicated – it would be a real win for patients. Best of luck to your uncle!